So... here's a little intro for non-bikers. 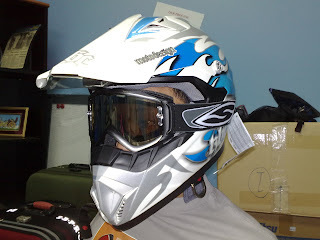 Motocross or scrambler riders have a specific type of helmet that give them that look. Pointy chin guard & an obvious peak on top of the helmet + aggressive graphics. 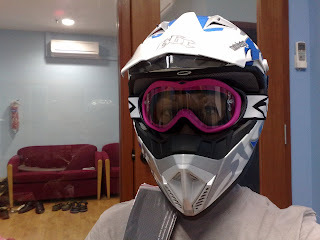 And motocross helmets don't have visors like normal helmets cos the dust & dirt just get thrown up in the trails & visors can't keep all the dust off your eyes. So in place of visors, there're goggles. Strapped firmly on your face so that there's little chance of dust blinding you. Testing our these Smith goggles for the first time, they were very comfy & moulded well to our faces. Best part was, Jameson, the importer was happy to sponsor them for our ride!